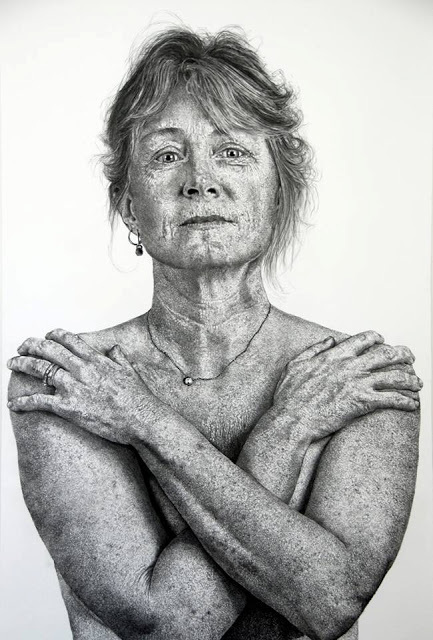 Sharon Butler blogs about the work of five artists, Beverly McIver, Ray DiCapua, Tim Doud, Anne Harris, and Bo Bartlett, who are finalists in the Outwin Boochever Portrait Competition, on display the National Portrait Gallery in Washington DC, through February 13, 2014. Butler's post includes thoughts on portraiture from each artist. Doud comments that "If portraiture is about identity, my portraits are about how identity is fabricated; that is, in our Facebook world, how an identity is largely an act of presentation: visible in the ways we appear or describe ourselves— race, class, and sexuality, and gender—and shaped by what a particular culture deems acceptable. Identity, then, varies constantly as we prepare ourselves for different publics." Harris notes that she is "not so interested in likeness, in this case my own, but I’m very interested in particularity, in the sensation of individuality and uniqueness, in the invitation to stare, in the tractor beam lockdown between the painting and the viewer."